For Annaïk Lou Pitteloud, fiction is the most sincere way of using photographic tools today. 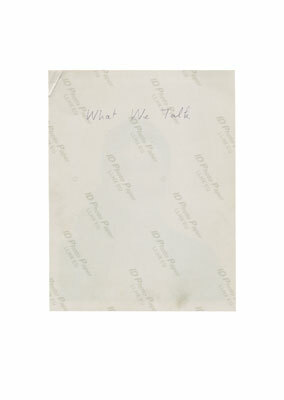 In «What We Talk», six «micro-fictions» are displayed, where the editing and research behind a photograph fulfils a duty towards honesty, and each of the difficulties encountered during the process become opportunities. Since there is no narration, you are left to find one. However, the more you think you have grasped, the less you actually do know. When confronted with the images in «What We Talk», the artist’s, image’s and spectator’s reality have to deal together in a referential and subjective sense. For her first solo show, Annaïk Lou Pitteloud also presents a very different kind of work. She uses various formats and set-ups for her photographs to let forth new visual «truths», which would have escaped notice in more traditional printing.